The BGN Family of Primary Schools took part in the Year 5/6 Sportshall Athletics competition at Blessed George Napier Catholic School on Thursday 24th January 2019. Ninety-four children from four Primary Schools including Bishop Loveday, Cropredy, Orchard Fields and St. John’s took part in various track and field events including; relay races, speed bounce, standing long jump and triple jump, vertical jump, javelin and chest push. 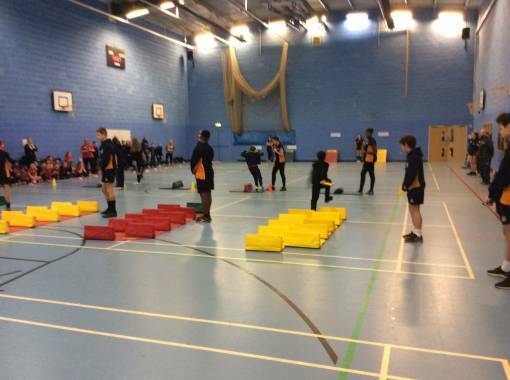 These events proved very popular with the young athletes who almost raised the roof of the Sports Hall with enthusiastic cheering and support! During the event, the Spirit of the Games value of teamwork was a key focus area. A boy and girl from each team was selected and presented with a special certificate to recognise the excellent teamwork skills they had shown throughout the competition. After a series of hotly contested track and field events, the competition was won comprehensively by St. John’s, recording many first place finishes in the process. Cropredy finished runners-up, followed by Bishop Loveday taking third spot and Orchard Fields fourth place. St. John’s will now represent the BGN Cluster at the North Oxfordshire School Sport Partnership Final on Friday 8nd March also at Blessed George Napier Catholic School. Thank you twenty-eight BGN Year 9 student sport leaders for doing a fantastic job officiating, proving guidance and encouraging the competitors throughout.